Watch Maher's record run in the race video above. On Friday night during the Monmouth County Championships Drew Maher of Shore Regional dropped a major time of 1:50.73 to win the 800m. Not only does that tie him for US#4 this season but it shattered the meet record of 1:53.4 held by CBA's Bob Carroll since 1984! He also moves up to second all-time in county history, only behind Robby Andrews of Manalapan who won the Meet of Champions in 2009 with a 1:48.66. The 400m split came through around a 53.5 and and then Maher took off on a time trial after that broke the rest of the leading athletes. This performance came after running a 4:13.91 two nights before for second in a duel with Tim McInerney of Christian Brothers Academy who ran a meet record of 4:10.75. No doubt that added to the fire for the Shore Regional star and state champ to come back and put on a show with his own statement race in the 800m. 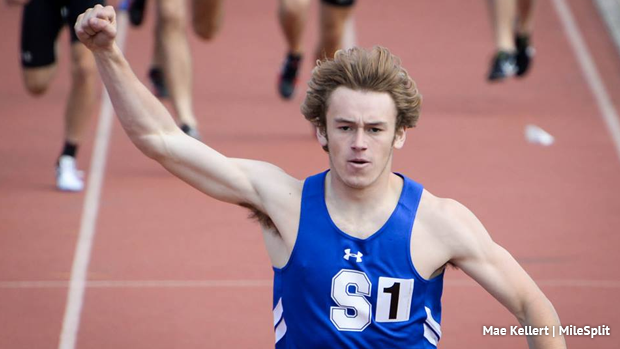 Now ranked NJ#2 US#4 in the 800m Maher also holds the state lead and cracks the top 25 nationally in the mile with his 4:11.94 from Penn Relays at the end of April. Looking at the Shore Conference Championships, which are scheduled for May 16th, the meet record there is definitely a possibility for Maher as well should he choose to run it. The Shore Conference meet standard is set at 1:52.9, a shared record by Greg Otey of Long Branch since 1982 and Rob Roche of Marlboro since 1985. Maher is slated to compete in the adidas Dream Mile on May 19th in Boston. His previous best was a 1:53.94 his sophomore year at New Balance Nationals Outdoor. Now in his senior spring season he has committed to Penn State next year.